5 Who won the Vietnam War? In 1919, Woodrow Wilson (D) was in Versailles attending the Paris Peace Conference when he got a letter from a young socialist asking to meet him. Wilson had a busy schedule; he ignored him—and set in motion a chain of events that led to the Vietnam War. The point isn't that I'm pro war, or even pro Vietnam war. It's that if we want to learn and grow we have to accept both the good and the bad of positions we agree/disagree with. This article tries to cover some of those tradeoffs for the Vietnam War. At least what lead up to Kent State, which is where the view of the war turned for American, internally/politically. May 4th's brings nearly annualized Ignorance: repeating one sides delusions, and inciting regular riots in the name of their anti-Government delusions. I lived within 5 miles of Kent State University, worked less than a mile away at the Kent-Ravenna Record-Courier, and read both the school and Newspaper archives. And I watched the nearly yearly riots commemorating the riot that got 4 students killed over 30 years ago. If that makes no sense, welcome to this world and the teenage mind (sometimes in much older bodies). These riots are fomented by faculty and people with causes, who want to prove they've learned nothing in 30 years, and still accept no responsibility for what happened, because everything they see, interpret and teach, goes through their biased filter -- making a one time tragedy into a cult, worshiping an event that barely resembles what really happened. This tries to explain some of the truths to those who haven't put in the research time on their own. Or only listened to the popular narrative. 1972 - The Paris Peace Accords in 1972. Vietnam surrendered, we had a peace agreement and everything was fine. Tada. War over. 1975 - in January 1975 the North tried a probing attack to see if the U.S. would stop them (the South had a 2:1 advantage in most areas like artillery/planes/etc -- but no money for fuel). The Democrats denied treaties and obligations, and without that financial support, the NVA overran the country by the end of April. So Americans didn't lose the first Vietnam war. Democrats lost us the second one, by letting Russia, China and North Vietnam know they could have it. His contention was that the U.S. wasn’t just fighting to protect South Vietnam from the Communist yoke, but that the U.S. was fighting to protect all of Southeast Asia (including his native Singapore). He wrote that although South Vietnam, Cambodia and Laos fell to Communism, the U.S.’s fight delayed the Communist surge long enough for Thailand, Malaysia, Singapore, Indonesia and the Philippines to develop their nations economically enough to make the Communist lure undesirable. Prime Minister Lee argued that had the U.S. not fought the Vietnam War, Communism would have taken over all of Southeast Asia. 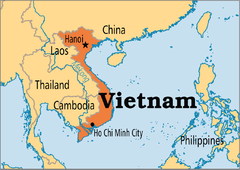 The U.S.’s participation in the Vietnam War allowed the much larger portion of the Southeast Asian population to escape the yoke of Communism. And in Lee’s eyes (as a significant insider), this meant the U.S. largely won the Vietnam War, even though Indochina fell to Communism. Despite the historical and philosophical importance of that, and who it was spoken by, where have you ever heard that taught in public school or mentioned on the airwaves. That little things can have big impacts. Ignoring socialists or pretending their ideology isn't poisonous is something you should do at your own peril. The silly College kids or rebels of today, are the ones willing to murder your family or everyone that opposes them in the future. Like Ho Chi Minh. That we didn't lose the war. We won. Democrats later gave up the promises and the second Vietnam War, because political expediency was worth more than the millions of lives lost or ruined in the name of "peace". That to this day, the young, Democrat-Educated, and gullible, still can't take responsibility for anything that happened and their contributions to the mess. That they got us into the war, then undermined our ability to win it, then bailed on our allies when they needed us most. That they encouraged young kids and radicals to fight to undermine American interests and divide us for votes. Then when their rabble-rousers eventually caused a massacre, they took no responsibility, blamed the other side, and invented fictions around what happened and why. The point is NOT that you had to be for (or against) the War. I have no problem with sincere peaceniks, who are willing to let millions die for their beliefs in non-intervention, or that it wasn't our fight. They're right about that. And we certainly fucked things up. What I have a problem with is the historical revisionists that are doing their best to NOT learn the lessons offered by history, by ignoring what happened and why. That increases the odds that we will repeat those mistakes, because we haven't studied what the mistakes were, and most think what happened is something else. Mature adults can admit mistakes and learn from them. Republicans were far from innocent in the mess that became the Vietnam Wars, and I could go on and on about that -- but I don't have to. The Press/Media and leftists in Sociology and History departments will do it for me, in caricature and exaggerated form. So no need to beat that dead horse. But Democrats will usually deny history, or revise it, into some fiction where they were the good guys and did nothing wrong. And THAT I have a bigger problem with. They and their peaceniks got up to 6 Million killed in the name of peace -- and they need their noses rubbed in it, until they can openly own and admit they had something to do with it, and thus they're willing to learn that ego is less important than the lives of the future. (Those who will be lost if we don't learn the TRUE lessons that the dead paid with their lives to teach us). This page was last edited on 26 March 2019, at 04:44.